We won the first price with the large scale VR game “Holopac”. 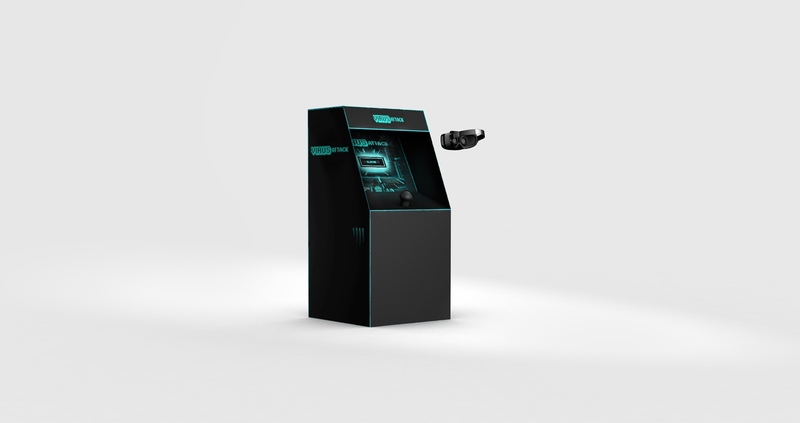 The whole concept, design, developing, testing and presenting done by a team of 4 people, within 48 h.
Holopac is a tribute to Pacman, one of the games from the very beginning of computer games. While it builds on the basic rules of Pacman, it provides an exciting and unique first-person VR experience, introducing time constraints and the fight against dangerous antivirus bots. Will you escape in time? Time pressure and hardware limitation forced us to find smart solutions for smart design & development. My task as the team’s design lead was to develop the entire visual appearance for: graphics, 3D Assets, textures, presentation, logos and key visuals. Continuing to work with the team of Holodeck VR even after the Hackathon: Supporting at various trade fairs in Europe, bringing in new games, ideas and trying out various developments: like GTA5 or pong in virtual reality on a 600 square meter walkable game area.